The excellent and super powerful Ram 3500 is extremely versatile, available in a number of configurations to make it perfect for you and your needs. 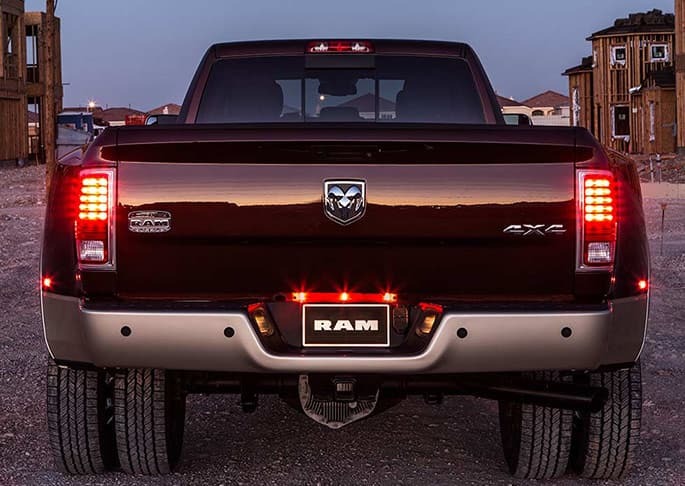 Coming in different cab styles and box lengths, the Ram 3500 competes in the same segment as the GMC Sierra HD, Ford F-Series Super Duty, and Chevrolet Silverado HD. For 2015, the 3500 has gained hill descent control with its Ram Power Wagon configuration. Additionally, there is available work-grade vinyl seats and power-folding towing mirrors. The 3500 packs a punch with a number of powertrain options. Standard is a 5.7-liter Hemi V-8 engine with 383 horsepower and 400 pounds-feet of torque. A 6.4-liter Hemi V-8 is also available with 429 pounds-feet of torque with 410 horsepower. For the most capable ride, consider the turbo-diesel Cummins option. This engine is a 6.7-liter V-8, and produces 350 horsepower and 660 pounds-feet of torque (six-speed manual), and 385 horsepower and 865 pounds-feet of torque (3500 with available automatic transmission). Available in either rear- or four-wheel drive, the 3500 comes standard with a six-speed automatic transmission tough a six-speed manual is also available. The interior of the 3500 is incredibly elegant, with real wood trim, your choice of leather, cloth or vinyl upholstery, dual-zone air conditioning, a heated steering wheel in addition to heated front and rear seats, remote start, and ventilated front seats. Technological features are great, with an available is an 8.4-inch touch-screen Uconnect media system, a navigational system, and 7-inch screen instrument panel. Also available is an AM/FM stereo with USB port and MP3 jack. The outside displays a rugged design, power-folding heated side mirrors, boasting unique grille finishes, RamBox storage bins in cargo-bed sides, LED taillights, a spray-in bedliner, three optional wheel sizes, running boards, and a power sunroof. Available safety and security equipment include a backup camera, integrated trailer brake controllers, rear parking sensors, electronic roll mitigation, and trailer-sway control. Want to learn more about the super capable 2015 Ram 3500? Give us a call, or fill out the form below, and we will be in touch!